The Windsor of Bradenton was our first choice for my brother-in-law, but their pricing was a little higher. It was very clean and updated, and the staff members were very accommodating. They all met with us. It's strictly assisted living and it's a smaller community. The dining room was very nice. The whole place was a little upscale and very nice. The rooms, however, were studios. Everything was just in one room. The Windsor of Bradenton is great. My loved ones have been there for about a month. It's small and friendly. They always have something going on and a lot to offer. The food's really good, too. I think it's a good fit. They have an assigned seat at the dining room so they always know that's where they go, and I like that. My mom moved in about a week ago at the Windsor, and she’s doing very well. We’re delighted; I think it’s a wonderful place. She’s very happy there. It’s relatively small in size and very friendly. It’s very close to where she used to live, and her friends all know it; it’s easy for them to get to. One staff has been very business-like and reserved, but the rest of the staff is very upgoing, friendly, and seems to be high energy. She is eating more than she did when she was in her own home. She goes to every meal so far even though she has her own little kitchenette. The rooms are nice. She got most of the things she was wanting to take with her. The bathrooms are nice; they have very easy access into the shower area. Safety-wise, compared to all the different places we looked at, I’m very pleased with them. They didn’t have even just one hand rail in the hallways in all of the facilities except the Windsor. The Windsor was very nice. There were plenty of amenities and plenty of services that they offer. I would put my family member there if the price was right. I think it was one of the higher-priced ones, but not too high to be unaffordable. I was doing this for my neighbor lady who is 96 years old. I was doing it for her nephews who live out-of-state. The décor was very pretty with the coloring that they chose. It all blended very well, and it was, of course, very neat and very clean. I was able to visit The Windsor at Bradenton, and it was a pretty community. It's very upscale looking, but it's got a smell to it. The staff was nice. I saw that a lot of people seemed to be sitting around a lot, and there's not much activity. My mother is going to The Windsor of Bradenton. She is going to have a private room there. All the rooms are the same. She wanted her own bathroom, and they have that there. There were two ladies who were really upbeat and happy, and the rest of the staff seemed really nice. They have playing cards, bingo, and they said they would take their residents on field trips to the beach, etc. Windsor of Bradenton was larger, so they had more amenities. It has a nice layout. The food was better. I think it's because they have a larger population. But not quite as intimate because it's a much larger facility. The staff is very helpful and friendly. The rooms were very nice. It's bright, airy, lots of windows, nice interior courtyard, large dining room, and large activity room. They have all the same things, like crafts, bingo, birthday parties, and movie nights. Describe the overall population of assisted living residents at The Windsor of Bradenton. What is their average age? What are their favorite things to do? The Windsor of Bradenton is very proud to have a diverse community of residents who enjoy a wide range of activities from physical exercise, exploring their artistic talents, cooking classes and volunteering their time in various local community projects, just to name a few. What programs or activities does The Windsor of Bradenton offer to enrich residents' well-being? Some of the life enrichment opportunities include: trips to the theater and art venues, outings to shopping and attractions, community and cultural events, informative lectures and educational speakers, volunteer opportunities, fitness classes, walking groups, social and themed parties, book clubs, family events and much more. What transportation services does The Windsor of Bradenton offer to assisted living residents? The Windsor of Bradenton offers scheduled transportation via shuttle buses for our assisted living resident’s convenience. 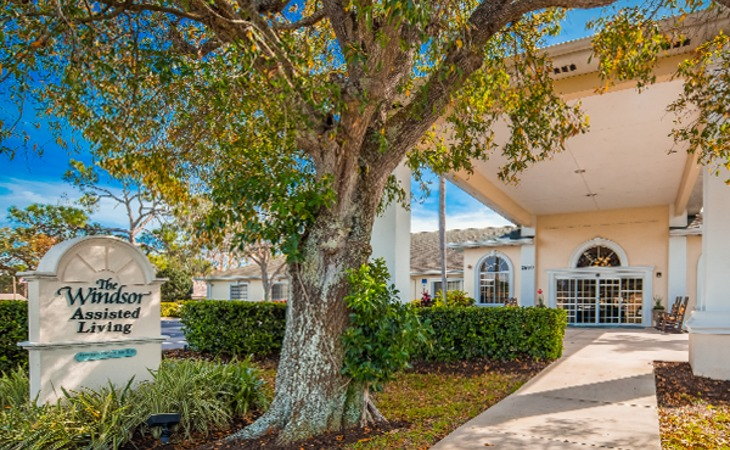 The Windsor of Bradenton is equipped with a porte-cochere for the convenience and safety of all residents. What makes the chef or dining program at The Windsor of Bradenton exceptional? What kind of menu can assisted living residents expect? The Windsor of Bradenton offers a Gold Leaf Dining experience for all residents which entail fresh prepared meals in our own kitchen by our staff of professional Gold Leaf Chefs. Breakfast consists of a wide array of traditional breakfast items, including eggs cooked to order. For lunch and dinner, you may choose a freshly prepared selection from the Gold Leaf Choice menu or the Café Select menu, and your choice will be brought to your table by one of our friendly wait staff. The Gold Leaf Choice menu is created by the chef and changes daily. What safety features or security measures does The Windsor of Bradenton offer to assisted living residents? Trained associates are on the premises 24-hours a day, electromagnetic locking doors, specialty carpets near doors with alarms, etc. How does The Windsor of Bradenton keep residents' families informed about their loved ones? The Windsor of Bradenton publishes a monthly newsletter which often contains a calendar of planned events, a schedule of daily activities is posted at the community. Families will receive a phone call if there is any change in the health of the resident. What is the care staff-to-resident ratio at The Windsor of Bradenton during daytime and nighttime hours? Staff-to-resident ratio will fluctuate depending on the number of residents. If The Windsor of Bradenton accepts dogs or cats, what indoor/outdoor areas can they enjoy? Residents are allowed to have well-behaved pets and there is ample space outdoors for residents to enjoy with their pets. Associates receive training through a thorough onboarding program and ongoing, annual training as required by the state regulations. Department heads are required to participate in bi-annual training in their designated field of expertise. What safety features or security measures does The Windsor of Bradenton provide to protect residents who wander? When residents appear to be moving towards an exit, associates are trained to re-direct them back to their activities or apartments. Special carpet designed to deter residents are placed around fire exits and the doors in each community are installed with electro-magnetic locking systems. The Windsor is a licensed assisted living residence dedicated to providing quality services in a warm, comfortable environment. We offer professional, personalized services designed to enhance the quality of life for those we serve. We have been serving the needs of senior adults since 1990 and remain dedicated to those who entrust their housing and service needs to us. At The Windsor, we are dedicated to each Residents' independence, choices and dignity. Visit us for a tour and you'll see how our combination of a warm residential setting along with the caring, helpful staff at The Windsor is just the right choice for your housing or service needs. At The Windsor, we recognize that each person has individual needs and preferences. With this in mind, The Windsor Tailored Services Program provides flexible service combinations. You may choose only the services included in the base monthly rate, or select additional personal care services and assistance. Either way, you pay only for the services you need. Enriching activities at The Windsor include crafts, games, reading, fun trips, spiritual services, and much more. The Windsor wellness program includes fun exercise, activities, and educational opportunities. Discover new talents and interests as you make new friends at The Windsor. At the foundation of our approach to service are fundamental concepts we believe important to every senior. These concepts are also critical in our approach to creating quality environments and service delivery programs. Lovely U-Shape building provides better accessibility for residents. Excellent activities and outing program that keep our residents engaged both mentally and physically. What should caregivers and potential residents know about The Windsor of Bradenton?